Do you like angst? I mean serious over the top, oh-my-god-when-will-it-end angst? No, well then this is not the book for you or probably the author for you because her books contain more angst than conceivably possible. I kid you not. While I neither want or need over the top angst in my books all the time for whatever reason I occasionally feel the need to read a book that pushes the limits in this regard and this is one of my go to authors when I feel like being angst ridden and this book definitely delivered in that department. 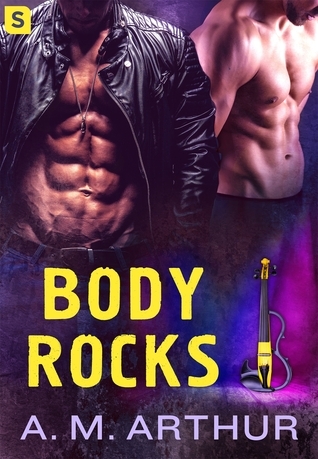 'Body Rocks' is the story of Trey Connor and Dominic Bounds. Trey belongs to an Indie Rock group called Fading Daze and Dominic plays with the group XYZ. Trey and Dominic first meet when Dom performs at an open mic night at the bar where Trey works. Their attraction is instantaneous and neither is aware of who the other one is, but this is short lived when Trey tells Dom the story of how they've been selected to perform at Unbound the music competition that's going to give some lucky musicians their big break, if they find someone to replace their recently defected drummer who now belongs to the band XYZ...the enemy. Dom could confess who he is at this point...but...nope doesn't happen. Throughout the story we are given a veritable laundry list of issues that our MCs and some of the secondary characters have to deal with. For the most part this is pretty much the norm for this author so I knew this going into the story and truthfully have no real issue with it. Not all of these issues occur on page, several of them in fact occur prior to the story but have some impact on events that occur during the story. I'm not going to go into specific details of all the issues presented by this story because truly this review would become considerably longer than I have time to write and you have time to read. My friend Vivian described it as 'a social issues whack-a-mole' in her review. Which for me is such an accurate description because as fast as one issue was dealt with another popped up, just like those little mole heads you hit with the hammer when playing whack-a-mole...see it works. What I didn't like and what kept this from being a better than ok read for me was the conversations. I found I couldn't decide if I was at a pep rally or a self help conference...Dr. Phil would have been proud. I was finding myself incredibly bored at times. Also my pet peeve about the use of the word babe or baby as a term of endearment reared it's ugly little head. A quick count showed that this occurred approximately 32 times and that was excluding any uses of the word in a non-endearment form (this added about 6 more to the count). While it didn't necessarily bother me, I was a little put off by the music that was supposedly representative of what an Indie Rock artist would either play or listen to. I just had a hard time believing that it would be artist such as Katy Perry, Beyonce, Bruno Mars and Evanescence. Don't get me wrong personally I enjoy these artist. I love the song 'My Immortal' but I think maybe if there'd been some Arcade Fire, The Cardigans, Teagan and Sara, Radiohead, The Killers, Imagine Dragons. These are all successful Indie Rock bands that are just a google away and I find it a little doubtful that a band wanting to get into this genre wouldn't listen to those who have already made it in the industry and perform music more in sync with the style of these bands than someone like Bruno Mars or Taylor swift who are more mainstream pop...it's not a right or wrong it thing it just would have felt more realistic to me that a performer would immerse them self more into the music genre that they wanted to succeed in. So what did I enjoy you might be wondering...well, I liked Dom and his family. I loved that Dom understood and appreciated the family that he had. I liked Trey, I liked that he focused more on making the life he wanted for himself over being bitter about the family that he'd been born into and that didn't deserve him. Dani and Lincoln, they were Trey and Dom's best friends and while they were good friends and loyal they were also the type of friend who spoke truth rather than taking the easy way out and telling their friend what they wanted to hear instead of what they needed to hear. As well the last 30 to 35% of the book just flowed better for me and that constant thread of boredom that I'd had in the first part of the book stopped. As far as this author's writing style goes there weren't any surprises for me. The story concept was good and held strong potential, however, maybe it was a case of trying to deliver too much that kept it from being an awesome reading experience and just left it at ok for me. A copy of this book was received from the publisher via Net Galley in exchange for an honest review.